Mature Moggies Campaign - and Mr. Boots. Charlotte who adopted Mr. Boots A.K.A. Albert was asked some quite tricky questions as part of the latest Mature Moggie Campaign organised by Cats Protection. My fiancée Dave and I always planned to adopt a cat who might be overlooked due to not being a kitten. Mr. Boots (now Albert) spent two long years at Cats Protection Trafford Branch (TCP) - including two Christmases. Whilst other cats came and went, he waited patiently and displayed a very loving, kind and affectionate personality. Albert built up quite the fan base at TCP, which isn't surprising really given that older cats are usually very grateful and affectionate given their often tough past lives. 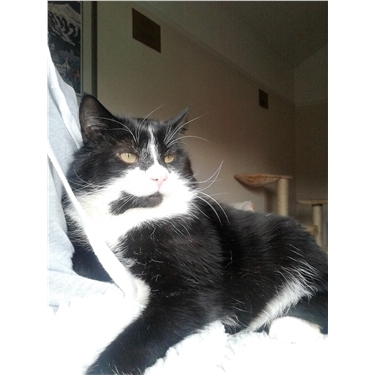 After reading Mr. Boots' / Albert's story on the Cats Protection Trafford Branch website and hearing about the clear love he had for people, adopting him was an incredibly easy decision to make. People regularly say how lucky Albert is to have been adopted and to have such a loving home. But genuinely, I feel the opposite is true… we are incredibly lucky to have him! Naturally we did gain a sense of altruism when adopting him, but his loving and affectionate personality is something we are incredibly grateful for, helping us both to relax and be calm after busy days at work. As mentioned above, I have discovered that more mature moggies tend to be more grateful, affectionate and calmer when compared to younger kitties. Albert is no exception and genuinely steals the hearts of everyone he meets due to his loving ways. However, having said that, seeing him play for the first time and seeing him explore the garden after a number of years in foster care was the best thing ever. What you think the benefits of owning an older cat are? The great thing about having an older cat is the reassurance. They are there to greet you at home and are grateful for the love and care you give them. My fiancée and I both have busy careers. When we are not at home, there is nothing to worry about as Albert just eats and sleeps. When we are at home, he loves to have a cuddle and now regularly plays with his toys. Having an older moggy suits our lifestyle...those with busy careers will find an older moggy is a great choice. Why you love your older cat and tell us about your cat's character? We love Albert because, like the majority of older rescue cats, he is so grateful for the love and care you give him. Not only that, because he now has reassurance that he has a forever home, we have seen him grow in confidence as he now regularly plays and rolls around... something he has never done in the past. I don't think there is any better feeling than seeing this new confidence and playfulness, something I have since learned is a sign of a cat being very happy and content. Adopting an older cat is, no exaggeration, one of the best decisions we have made. Albert is now part of the family and brings us such happiness. Please, if you do see an older cat that needs a home, go with your gut and give them a chance. After the many 'thank you' blinks you will receive from your new feline friend, you will be so happy with your decision to adopt a mature moggy. To Charlotte, Dave and Albert - thank you so, so much for taking the time, being involved and making such a massive difference to so many lives… together we can all make a difference - Cats Protection Trafford Branch.